Can you believe that July is almost over? We have the strangest weather here this year. One day it’s about 100 degrees and the next it barely gets into the 70s. The month has breezed by filled with gardening (my tomato plants are all dying and I don’t know why), going to the zoo, taking kids to swimming lessons (do other grandma’s do this?) and training a new puppy (sometimes I think he is training me). I still haven’t finished the quilt for Anna’s nursery (although the room looks pretty cute even without it). Nor have I finished Lisa’s pillows or the baby-sling for a young girl at church (I am not supposed to make that until the day before the shower anyway, right?). I have just been too busy having fun with my embroidery. 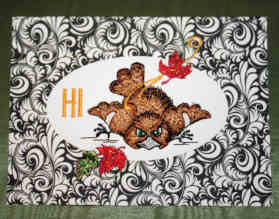 This week I decided to try some of the brand new Print ‘n’ Stitch Note cards from Designs Magazine. So I got a couple of sets of the cards and started playing to see what I could do. Here is the first one that I created. It really was fun and simple. If you want to try one similar to mine here are the steps. If you don’t own Catalog Xpress or Alphabet Xpress you can download trial versions. 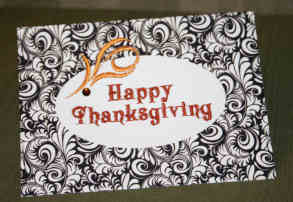 If you want to print a message inside the card using your PC’s printer do that before you begin the embroidery. Measure the circle and determine what size you want the design to be. I brought the X-mas mouse from the Starbird’s Christmas Mice into Catalog Xpress, sized him down to 75% and saved him. If you haven’t purchased the mouse you can use a design from your own collection. You can recolor the design in Cat Xpress too if you like. Next open Alphabet Xpress and merge the saved mouse onto the screen. Click the text button. Type Merry Merry Merry and choose the Stonehouse font. Change the size to .40 inches and apply. Move the text down on the grid so it is about ½” below the design. Click the select button and then go to edit and choose select all. To the right of the Alignment Icon click the down arrow and choose Horizontal Align Center Selected Objects. Save the design in your format. Print a template. Then bring it up in your machine. Hoop your 5”X7” hoop with a self-adhesive tear-away stabilizer. This time I used Amazing Designs Smart Sheets Medium weight self-adhesive. With a straight pin score a rectangle in the center of the hoop about 2” tall by 4” wide. Tear the rectangle of paper off to expose the adhesive. Draw a horizontal line across the stabilizer. Very, very lightly pencil the center on each just at the edge of the card front sides. Match up with the line on the stabilizer and press to adhere. Place your printed design template on the card front where you want the design to be and check to be sure the needle centers match up. If not move the design in the machine until you are satisfied. 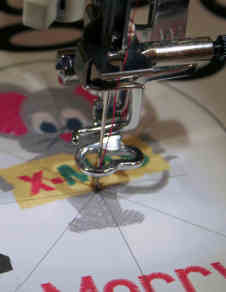 Remove the template and embroider the design. Remove from the hoop and carefully tear away the stabilizer. Erase any visible pencil markings from the card front. Add other embellishments as desired. I used my Dalco Crystals and Wand to add a little sparkle to the one above. 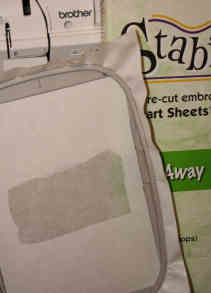 Cover the embroidery inside with one of the stitch covers. Here are a few more ideas for cards made with these sets. The Hi design is free so you can click here to download it and try it if you like. The Happy Thanksgiving will be included in the Ann’s Club August Phrases. We will include the swirl design as well. The little bird is from the Morango Cute Bird collection that will be available very soon. 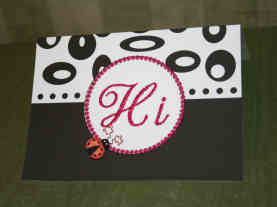 If you like to use templates the Placement Kit makes setting the card up a breeze. The step-by-step instructions are easy to follow and Eileen has created some great video clips that you might want to take a look at. If you already have the Magna Hoop these little templates and target rulers work with the version for your 5X7 hoop. This sewable paper crafting is really addictive. It’s a great way to expand your embroidery creations and use more of those designs we have all collected. Make a few cards and put them up on Ann’s Gallery. We all love the inspiration we get from seeing what our ME friends have created. PS: Here's that wayward puppy Cosmo. 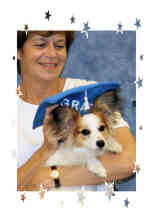 They let him graduate from puppy school but I am not sure how much he learned. You did a WONDERFUL job explaining how to do this!!! It looks like us beginners could do this!!!! Just curious did you use a SPECIFIC size or type of needle???? Can we just use any dulling needle too? I've gotten very lazy about sending cards because they seem so expensive for something so ordinary. These will make the occasion even mere special! I hope Eileen Roche will come up with some special cards for Christmas. I embroidered my Christmas cards last year and enjoyed every minute of it. Actually saved $ in doing so. When I received an email regarding the new Eileen Roche cards, I was all over them. Ordered them yesterday and cannot wait to work on them. Still have relatives who refuse to utilize a computer; hence, I must write to them...arrrrggggggghhhhhhhhhhhhh! Real cute except I don't agree with "X-MAS" That takes Christ out of Christmas. These really are very charming. I did note, however, that you used a 5x7 hoop. Will the project work equally well with the 4x4 that some of us are still using? Also noticed your pup is a Papillon. Since that's another one of my addictions (along with ME), I had to smile. We have two Paps. One is a puppy, and the other is a rescue Papillon about 2 years old. Have you (or anyone else) used some of the other papers available for paper embroidery (like...is it Kiwi?)? Would like to hear about that as well. One more thing...about the Xmas....did any of you know that using that X was common in the early church when to be a Christian was seriously dangerous? So, although I'm a Christian, I don't find it offensive. Ok, so I'm a real blond! I remembered where I had read about Kiwi paper, and it was your earlier blog. However, the Pappy comments are still appropriate! paper (not just Kiwi paper according to my ME instructor. )..I bought a ream of card stock paper at a speciality store...thinking I did great, but it wasn't thick enough, so I haven't actually got to do it yet...but am looking forward to it. I quit sending cards a few years ago but I think I am going to try your project. Oh by the way, where are you located? Please send some 70 degree weather my way (Eastern TX) Very nice project. Can't wait to get to it. joshedd: I apologize if the little mouse made you feel that I believe Christmas is less important than it should be. Since for believers it is the reason we celebrate I would never, ever want to give that impression. borden47: If you have any leftovers of the cards you embroidered last year post one to inspire us all. After all that is what this is all about. ritamae: I will try the 4x4 hoop and let you know. It appears from visually looking at it that it will work just fine. Yes, Cosmo is a Papillion. He is our second. Arnie, our first was a rescue and we loved him for 14 years. travelbug: Yes, you can use some cardstock and specialty handmade papers with outline style or very lightweight designs. But be careful, I have had a lot of not so happy results with some I have tried. This Kiwi Paper is the best I have ever used. cettlb: I am in the Midwest. It looks like our cool weather is fast coming to an end. It will be 95 degrees here tomorrow with an index of 100. Try these cards - you might become addicted too. I have been looking at these for so long and so want to try them! You make it seem so easy,and the instructions are easy to follow. You have actually made it exciting to "write" to people again,as is the case with borden47, I too still have family members that refuse to use a computer.LOL.I will be placing and order for these as well! Thank you for this great information. I wondered about heavy card stock, bought some, and was disappointed in the results. I am going to try these too. They are not expensive in relation to the ones in the stores. I just feel like they got to be too much money and I stopped sending cards. Now I will be sending something really unique and not nearly as much money. Now if the post office will stop increasing their fees. . . .
Is there any rules about the designs that are best for these? I am thinking of lots of ideas for "thinking of you" and "get well" and others in addition to the holiday ideas. BTW, that puppy may have gone to 'school' but, I will bet it was the humans that were being trained!! Cosmo is just adorable. When he is tired of living with you, give him my address. LOL! I did a card embroidered in the 4X4 hoop. It did great. I put it in the project gallery if you want to see it. Pat: As far as what design to use I have found that almost any design will work. Now, that being said, I did not try any of those really old ones from the 1990s that were bullet-proof in their density. But the Hummingbird and the little brown bird have lots of stitches and underlay and they both did fine. If you have software and want to remove the underlay you could since you do not need it to stabilize paper. Still I prefer small, fast and easy designs since these are cards and not my forever creations. 1. Sticky, tear-away paper works better than spray adhesive - especially in the 4x4 hoop. 2. If I use dark lettering I like the finished look better if I use the same color in the bobbin for only the lettering. Sharon is right that some of the "fiber" papers like mulberry will stand up to embroidery of outline or very light designs. These are great for adding accents to scrapbook pages or handmade cards but I really do think you will fall in love the Kiwi paper and cards. Read your note above regarding posting a Christmas card photo I did last year. I did not originally post the card for 3 reasons: 1. was not an ATG design, 2. could not compare to Eileen Roche cards (!) and, 3. only had TOTAL REJECT sample remaining. I also had to recall the name of the magazine so that proper credit could be given for the card design. Tree was done on white cardstock, glued to red cardstock so no stitching showed and cards were already creased for folding. I have posted the Christmas Card and PALEEZE keep in mind that is card is a reject. I love embroidering and making paper crafts and combining them into cards. Soon ME cards will be as popular as peanut butter and jelly sandwiches. Hi, have had an go at embroidering Kiwi paper, but have not had any luck. They always break through the paper. I have tried all sorts of patterns, needles ,threadtypes & stabiliser but still can't complete one. A thread stash is a good thing! Like fabric, you can never have too much thread. Especially good thread like Robison Anton and Madeira. Anyone who has ever sewed or embroidered knows how frustrating it is to be engaged in a project and run out of bobbin thread. If you have never used pre-wound bobbins, you will find they are the eighth great wonder of the world. It's not that it is difficult to wind a bobbin, it's just not very much fun and typically needs done at the most inopportune times. Get these for your mom and she will think of you every time she pops one into the machine. Guaranteed. Some people believe gift certificates are unimaginative and impersonal. I disagree. I believe they allow the recipient to choose exactly what she wants and she doesn't even have to leave home. Denominations of $10, $25, $50, $100, and $250 can be purchased in various combinations and used for thread, designs, tools, books, videos, Ott lights, and more. I am so fortunate to have a mom who is truly an angel on earth. 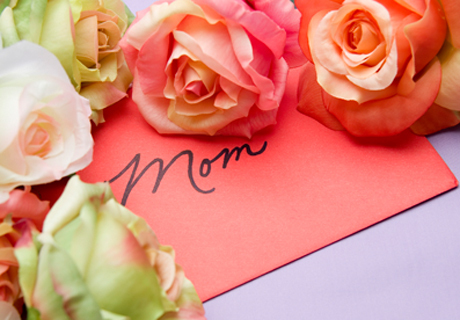 To all you creative moms out there, Happy Mother's Day! If you create a Mother's Day gift, be sure to post it here.